Specially formulated for people with braces, dry mouth, fragile and sensitive gums, sores in the corners of the mouth and for those who want to avoid harsh chemicals and preservatives. Daily use will help you maintain healthy teeth and gums. As a dentist, I have a number of patients who have skin irritation in and around the mouth. My treatment recommendations include using toothpaste that has no SLS (sodium lauryl sulfate), no sorbitol, no fluoride and no preservatives. SLS is a detergent too harsh for some people. Fluoride and sorbitol can cause an allergic reaction in the mouth. I looked at many ingredient labels at health food stores. There would always be some chemical that I wanted to avoid. A friend of mine, Joy Winkels, has made healing ointments. 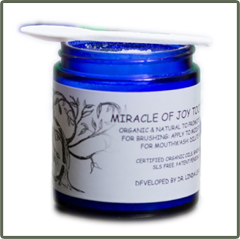 Her knowledge of herbs and essential oils has allowed us to develop The Miracle of Joy Tooth Crystals. Over the last 2 years, we tested the product on family, friends and patients who I thought would benefit. We chose xylitol for sweetness and the ability to starve cavity-causing bacteria. We chose baking soda to neutralize acids produced by bacteria in plaque and the ability to remove surface stains. We chose the essential oils to promote healing. Since our testing has been on humans and not animals, we have comments to share about the test results. "it helped my dry mouth, even all night"
"My son has braces and had a canker sore and I reminded him to use this and brush his teeth. The pain was soothed and the sore was gone in about 24 hours"
For more information or to comment click here to email us or give us a call at (218) 692-1522.